What are Asad Durrani and AS Dulat, ex spooks of India and Pakistan, trying to accomplish with their joint appearances and book collaboration? 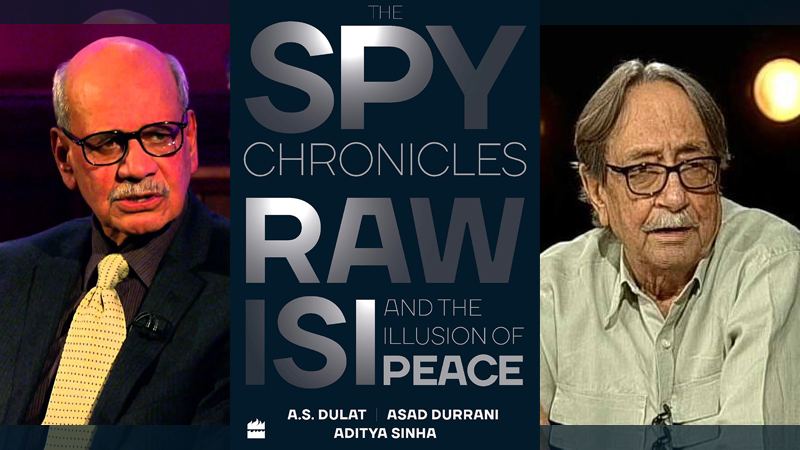 What is “Spy Chronicles: RAW, ISI and the Illusion of Peace" all about? What have the two revealed about the work of ISI and RAW spy agencies with Kashmiri insurgents? Has the Modi government lost control of the situation in Kashmir? Why does Durrani say that all Pakistan has to do now in Kashmir is "sit back and watch"? Why have both spy agencies been bribing the militants to buy influence? Is "corrupting someone with money more ethical than killing them" as AS Dulat has put it? Is Dulat's optimism about solution to Kashmir issue justified? Why are both Nawaz Sharif and Donald Trump attacking the "deep state" or "establishment" in their respective countries? Why are they both spinning conspiracy theories? Is it to deflect public attention from the serious allegations against them? How serious are the problems of Russia collusion in the US case and money laundering in Pakistan's case? Are they succeeding in their efforts? Are their defense strategies causing major harm to the national cohesion in Pakistan and US? How will it all end? Who's at Fault for Failure to Resolve Disputes: India or Pakistan? “For political reasons, I said it will not go down well in Pakistan that we cooperated with the United States to eliminate someone many Pakistanis considered a hero,” Mr. Durrani said of the raid on bin Laden’s compound, explaining why he thought the government denied prior knowledge of the operation. Other statements made by Mr. Durrani include Pakistan’s role in fomenting popular unrest in Kashmir, the disputed Himalayan region that is claimed in its entirety by both India and Pakistan. Officially, Pakistan has always maintained that it supports the population in Kashmir morally and diplomatically and denies any role in the armed, anti-India insurgency in the disputed region. India, however, has directly accused Pakistani military intelligence of long supporting militancy in Kashmir and the attack by Lashkar-e-Taiba militants that killed more than 200 people in Mumbai in 2008. While Mr. Durrani has received sympathy in India for the scrutiny he now faces, in Pakistan, he has been criticized. Several Pakistani civilian leaders have questioned Mr. Durrani’s actions and statements attributed in the book. Raza Rabbani, an influential opposition senator, said during a Senate session last week that any civilian teaming up with an Indian would have been quickly branded as a traitor. “It is shocking that on one hand Pakistan and India relations are at an all-time low and on the other hand, former spy chiefs of both the countries are teaming up to write a book,” Mr. Rabbani said. Adeeb Z. Safvi, a retired Pakistani Navy captain and defense analyst, said Mr. Durrani had shunned protocol by publishing the book without getting it reviewed by security services first, as is the custom with many countries, including the United States. It is rare for former powerful generals to be held accountable or questioned for their actions. Mr. Durrani also served as the director general of military intelligence and retired in 1993, but he has remained active in public life, having later served as Pakistan’s ambassador to Germany and to Saudi Arabia as well. For many Pakistanis, Mr. Durrani’s chumminess with his Indian counterpart was as problematic as his views. At the book release event in New Delhi last week, Mr. Durrani referred to more peaceful times, before the countries were partitioned in 1947. “In the good old days, I could have crossed, but I don’t think I’ll take the chance,” he said with a smile on his face. The audience, which included Manmohan Singh, India’s former prime minister, chuckled. When the video of his prepared remarks was over, the audience clapped thunderously. The Court of Inquiry’s proceedings will be closed to the public. It was not immediately clear how long would the inquiry take. Durrani comes across as candid and frank, even nonchalant at times but wedded to a narrative that has currency within the American policy circles. In comparison, Dulat is cautious, mostly diplomatic and quite circumspect in his responses. He remains guarded and even deliberately obfuscating when it comes to his own role or that of his organisation in scheming subterfuge and planning insurgencies in the region. For example Durrani appears to support Indian notions that the non-state actors in Pakistan are capable of launching the Mumbai like attacks and that it must warrant India to extract revenge by attacking targets inside Pakistan. Durrani sleepwalks into the setup as he starts to sympathize and endorse the Indian official view that the Mumbai terror attacks of November 2008 had backing from the elements within the ISI, a position that was recently articulated by Nawaz Sharif. Durrani uses a false claim from a CIA mole, David Headley, within the terrorist group Lashkar-e-Taiba about “an ISI major” to try to support Indian claims on the atrocity. The Mumbai Attacks remain couched in controversy amid gaping holes in the declarations that put the blame on the Pakistani state structures. Durrani also discredits Kashmiri political movement, Hurriyat Conference, and suggests that it was forged and later managed by the ISI. Although Durrani had left at the time the Hurriyat was formed, his claims have thoroughly embarrassed the Kashmiri leadership and compromised their prestige, including perhaps their future political weight and character. In comparison, Dulat is always slippery and evasive and avoids any references or acknowledgments to the incidents that might reveal unpleasant events and distasteful things. In fact, he does not reveal anything and even sounds insincere by deliberately choosing to ignore or deflect from the topics or events that needed his honest input to build trust in the exercise that this book sought to advance. While he talks about ISI’s role in specific terms, there is hardly any acknowledgment forthcoming on the RAW’s role in creating deadly and vicious counterinsurgency that was unleashed in Jammu and Kashmir or the murders in Wandhama or Chattisinghpora that targeted Hindus and Sikhs to malign the Kashmiri insurgency. He mentions in passing the first state-sponsored terror outfit Al-Faran that kidnapped some western tourists who are still untraceable after more than two decades. Dulat rejects the most authentic investigation into the kidnapping as revealed by two western authors Adrian Levy and Cathy-Scott-Clark in their famous book, The Meadow, which blames the Indian security agencies for the drama. While Dulat emphasizes a joint investigation of the Mumbai terror attack, he does not even bother about the 2007 Samjhuta Express train bombings that killed 76 civilians, mostly Pakistanis. In fact, there is no mention of the tragedy in the whole book. The former Indian spy chief shows utmost hesitation in talking about the alleged Indian spy, Kulbhushan Jadhav, and when he does he is extra cautious not to say anything that might incriminate him or his organization, RAW. Both of them seem unwilling to acknowledge the changing atmosphere in India – the rise of mass hatred and paranoia against Muslims, its official patronage and even justification, growing militarization of nationalism and its ever-changing new narratives as well as phenomenal increase in hatred against Muslims and Pakistan, and ossification of this revulsion across the elite society – from the military to politicians and media to diplomats. This informs the public opinion and their behaviour; causing an unprecedented surge in public violence, including murder, against the Muslims in particular. In his self-propelled enthusiasm, Durrani even proposes a confederation between the two countries – a fanciful prospect that Dulat is even reluctant to admire. I found interesting similarities between Durrani’s vision of Akhand Bharat and a US-funded official study about the future of South Asia. The study, Asia 2025, conducted by the US Undersecretary of Defence (Policy) in 1999, envisaged India taking over Pakistan after the US neutralizes Pakistani nuclear weapons to avoid a nuclear war following deadly ‘terrorist incursion’ from Azad Jammu and Kashmir (AJK) into the Indian side of the territory. As Pakistan loses control of the situation, it fails to respond to the Indian calls to reign in the militants, and as a result, India moves into AJK. According to the study, India also launches an unsuccessful conventional strike on Pakistani nuclear arsenal, prompting Pakistan to launch nuclear strikes against Indian forces along their common border. The US threatens China to keep away from the theatre of war and attacks and destroys the remainder of the Pakistani nuclear forces leading to total anarchy. In the American imagination, Pakistan disappears by 2020, and the Indian confederation emerges as a regional super state. In the meantime, Afghanistan is also dismembered and annexed by the neighbour states – Iran, Tajikistan and Uzbekistan – per their ethnic proximity. In the end, India and Iran emerge as great powers and become allies of the US willing “to participate in combined peace operations with the US” and also as a countervailing force against China. In his self-propelled enthusiasm, Durrani even proposes a confederation between the two countries – a fanciful prospect that Dulat is even reluctant to admire. I found interesting similarities between Durrani’s vision of Akhand Bharat and a US-funded official study about the future of South Asia. The study, Asia 2025, conducted by the US Undersecretary of Defence (Policy) in 1999, envisaged India taking over Pakistan after the US neutralizes Pakistani nuclear weapons to avoid a nuclear war following deadly ‘terrorist incursion’ from Azad Jammu and Kashmir (AJK) into the Indian side of the territory. As Pakistan loses control of the situation, it fails to respond to the Indian calls to reign in the militants, and as a result, India moves into AJK. According to the study, India also launches an unsuccessful conventional strike on Pakistani nuclear arsenal, prompting Pakistan to launch nuclear strikes against Indian forces along their common border. The US threatens China to keep away from the theatre of war and attacks and destroys the remainder of the Pakistani nuclear forces leading to total anarchy. In the American imagination, Pakistan disappears by 2020, and the Indian confederation emerges as a regional super state. In the meantime, Afghanistan is also dismembered and annexed by the neighbour states – Iran, Tajikistan and Uzbekistan – per their ethnic proximity. In the end, India and Iran emerge as great powers and become allies of the US willing “to participate in combined peace operations with the US” and also as a countervailing force against China.